July equals cycling for many. 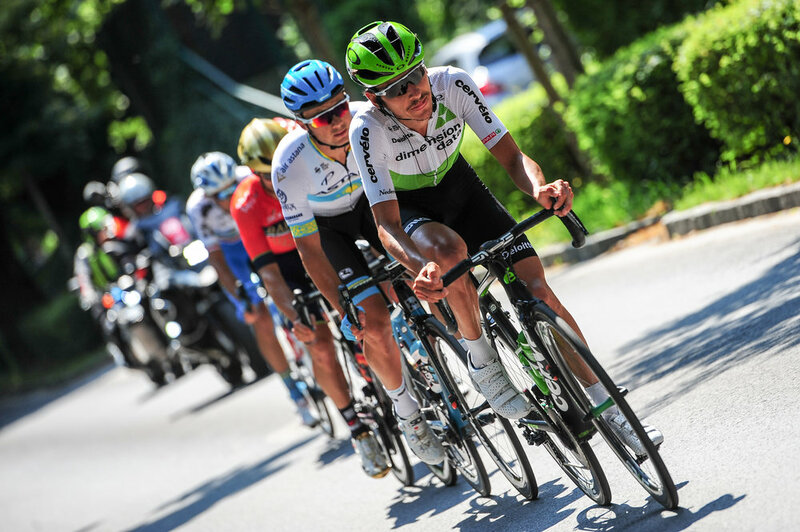 While our "one month of the year" followers tune in to the Tour de France, cycling’s core fans might also have the Tour of Austria in their periphery. France steals most of the pressure and hype creating a relaxed atmosphere in Austria. After a post Giro rest it served as a perfect launch pad for 2018 2.0. The Tour is the coolest thing you can do in cycling. We all want to be there, but it’s too hard and stressful to be “fun.” If a rider can't enjoy racing the Tour of Austria, on the other hand, they might want to rethink their career choice. Brutal and beautiful mountain stages, nice hotels, good food, smooth fast roads, and post race massage while watching the final km’s of the day’s TDF stage all make this one of my favourite races. A circuit with three short but steep climbs per lap opened the show. On the first lap we ripped up the climbs. A break escaped and we settled into an uncomfortable chase lead by team Bahrain. On the final lap the first and most difficult climb created a selection. Our entire team made the split and congregated near the front. I held back until the second climb with 10 km to go then surged off the front with a small group. The attack failed but softened up the field even more and on the final climb with 5 km to go, I tried again. These digs failed to earn a result but gave me confidence. On the first switchback of the final descent, a French rider took the inside of the turn risking it all and crashed hard. Despite the difficulty a group of 70 riders with fresh day one legs came to the finish. The breakaway battle wrapped up part way up the first category 1 climb of the day. We planned to protect Louis and take control late in the race while looking for opportunities to launch. Bahrain kept the speed high to control the breakaway. At the top of the second climb of the day my teammates and I lined up on the front. With 15 km to go heart rates and suspense edged into the red zone as the road continued upward. A rider from Astana attacked. I immediately shifted up a gear and latched onto his wheel. Bahrain followed. Our Scott Thwaites also joined and over the radio Johann said, “the bunch is sitting up, Ben, Go, Go, Go!” We crested the hill and throttled the next downhill. Team EF had missed the move and stretched the peloton to the tail end of our escape. Mohoric and Lutsenko countered. I sprinted after them on my limit. We hammered toward the finish into the last gradual climb, but teams sacrificed riders to bring us back. Just as the peloton caught us our director came on the radio, “Louis had a mechanical. We need to get him back.” I slipped out the back of the peloton as dropped riders wrenched on their handlebars in desperation. Looking over my shoulder I saw Louis and Lachlan come around a bend in the road. Lachlan swung wide and Louis jumped to my wheel. I paced Louis to the back of the peloton and passed him off to Johann who pulled him to the front of the action. After that effort I waited for a group to ride in with. Part way up the climb my right hamstring cramp. As I stretched it my left hamstring cramped. The gradient killed my momentum and for the first time ever during a race I actually got off the bike for a moment to stretch! Of course, if I was still in the first group I would have pedalled through the cramps but off the back it wasn’t worth the muscle damage that would do and I laughed it off. Known more for red bull style downhill skiing the road up the Kitzbuheler Horn would be the first test major GC test. We planned to take the front 10 km from the base of the climb and deliver Louis through the technical run-in with an opportunity to try himself against the other pure climbers. During the first part of the stage I entertained myself by trying to pronounce words on the Austrian road signs or read the names of the Russian riders on the backs of their helmets, but then we shifted to business mode. First Johann and Steve took over. I waited about two kilometres but they appeared to need reinforcements to maintain their blistering pace. I joined in taking massive turns and causing panic behind us. The peloton split even before the climb. Louis finished 15th while the rest of us ground up the 20% pitches to the finish then took a ski lift down the mountain with our bikes. We faced two tough climbs out the gate, a 5 km tunnel, long descent, and an 11 km uphill to the finish. After yesterday’s showdown Ben Hermans (Israel Cycling Academy) emerged as the clear GC favorite offering a chance to the breakaway. I covered all the dangerous attacks before the first climb, then on the climb Jaques, Lachlan, and Steve pitched in. My legs felt better than they had yet and I continued to jump with moves up and over the first climb. The breakaway battle continued as groups dropped off the back. On the second climb Steve became even more aggressive and the two of us took turns covering the attacks and counter attacks. Heading into the tunnel at the top of the second climb the pace had whittled the first group down to 25 riders with Johann, Louis, and me there and Steve and Lachlan just off the front. Through the tunnel Steve and Johann finally snapped the elastic and broke free. After a brief respite, Astana who had missed the breakaway attempted to shut it down. They kept the gap under a minute for what felt like hours, but the breakaway contained bigger engines. At the base of the last climb Steve went solo. We believed he had it in the back until we saw him standing beside the road with a mechanical issue. The peloton quickly split down to forty riders. Lachlan and I both attempted late attacks but the climb was more shallow than the profile indicated. I prepared for the sprint. Expecting a slower uphill finish, I allowed more belligerent riders to slot in ahead of me so that when the head of the peloton mushroomed I could carry speed through and deliver. The final three kilometres were much faster than I thought and although I had a good sprint I only placed 15th. I told my wife on the phone, “I have to be meaner and fight harder in finishes like this. I just didn’t think we’d hit the last km at 60 kph." Up, down, up, up, up. Cold rain soaked us from the clouds above and spray off the wheels below. The breakaway escaped early and we let it go. I froze on the downhill. Although I put on more clothing, once I started shivering I never warmed up. The Grossglockner climbed to high altitude and patches of unmelted snow. I made the first selection of thirty riders but dropped after a few km of climbing. Lachlan and Louis fought out the finish placing 13th and 23rd respectively. A rolling 70 km run in to 3000 meters of climbing over the final 100 km guaranteed suffering. Constant attacks kept the speed near 60 kph for an hour. Jacques, Scott, Johann and I tagged the moves. I tried to reserve my efforts for the uphill sections but the speed of the bunch never dropped. As the first and longest climb approached I blasted up a drag. Gaps opened everywhere in the peloton. When the dust settled I was in a group of 25 off the front. We rotated for 10 km then started climbing with a 40 second advantage. Our breakaway splintered. Halfway up the climb Mohoric and Lutsenko dangled 50 meters ahead of me and two other riders. In the switchbacks below we could see the charging peloton absorbing the rest of the breakaway one by one until they caught us too. I held on to a group of about thirty riders with Louis, Steve, and Lachlan. As my vision narrowed we reached the KOM and Lachlan mashed off the front with five riders. The peloton regrouped in the valley below. Lachlan’s group never caught Mohoric or Lutsenko. Behind them a desperate chase in the peloton ensued to prevent one of Lachlan’s companions from taking the overall lead. A raging chase over that terrain shredded the peloton down to thirty riders including me and Louis. I remembered my lesson from stage 4 and did not yield position to dangerous riders ignoring their profanity. I kicked to the line 4th in our group, but 12th on the stage. Lachlan placed 4th. Facing five laps up a steep four km climb we planned to play off of the tactics of other teams later in the race. The first attack of seven riders took off. Teams blocked the road, but I followed the next two riders to attack onto the dirt shoulder and up the road. Although we had nearly closed in on the seven leaders, the peloton ripped up the climb on the first lap. A group of twenty came across to us, and five more riders went clear. Atop the climb we waited to regroup so that Ben Hermans, still the overall leader, could have his team chase the large breakaway. Steve, Johann, and I lined up at the front behind two other teams as they led the chase down a rapid twisting downhill. A deceiving blind curve tightened up and Bahrain overcooked it. Two of their riders crashed forcing Steve over the guardrail. Johann unclipped and fishtailed. My speed was too high to touch the brakes so I leaned harder into the turn and prayed. Johann and I made it through, but Steve was forced to abandon with a massive swelling on his quad presumably from the guardrail. He said in the ambulance one of the crashed Bahrain riders pointed to his neck and told the medics, “I have pain here,” exposing a long gash in his neck. Fortunately the cut missed anything major and nobody was seriously injured. On the third ascent, Lachlan clicked up a few gears and floated away. One rider went with him and in one lap they bridged a two minute gap to the breakaway. His acceleration shrank the peloton to twenty riders. I made the split but once again we slowed to regroup at the top. On the fourth lap, the same selection happened but I didn’t make the cut. I chased in a group of ten, dropped them on another climb, but soon after they all whizzed by me motor pacing or actually holding onto a team car. They made it back but I didn’t. Louis placed 9th on the stage. “Sprint stage” did not imply “easy stage.” My teammates and I followed attacks at the start hit a climb, and once again Lachlan made his move drawing the breakaway card. The break contained rockstar engines and six different teams chased. A lack of cohesion encumbered the chase. One rider would pull super hard on an uphill and kill the rider behind him. All of this surging made it a difficult race. With fifty km to go Astana tried one last time to break Ben Hermans. 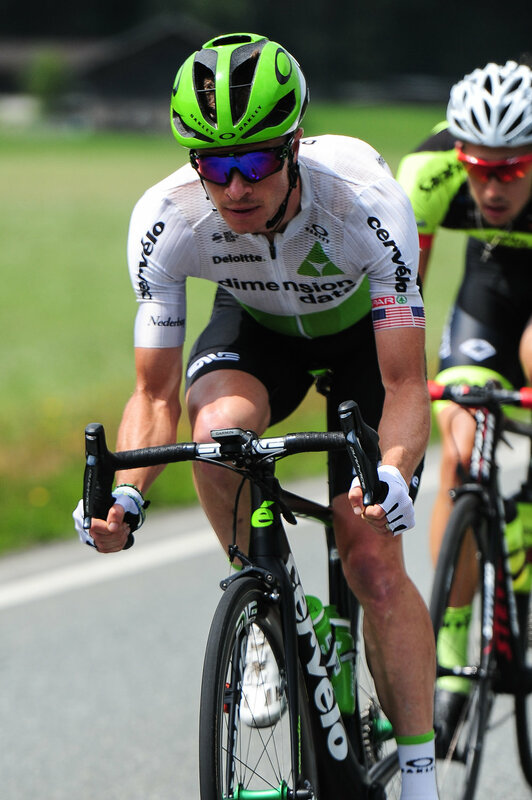 They attacked dropping all of the pace makers, but not Ben Hermans. This disruption further benefited the breakaway. Lachlan attempted to go alone with one km to go, but ended up fifth on the stage. The rest of us crossed the line together. Austria impressed providing an eight day block of intense racing. And get a load of this: Lachlan broke his wrist a month earlier. Think that is impressive? In March Scott Thwaites fractured multiple vertebrae and raced well with more metal in his spine than in his bike components. Individually and as a team we laid a great foundation for the second half of the season. Looking forward to it. Stay tuned!